Gerald Butts, Prime Minister Justin Trudeau's former principal secretary, is challenging former attorney general Jody Wilson-Raybould's version of events on the SNC-Lavalin file as he speaks before the House of Commons justice committee in Ottawa. 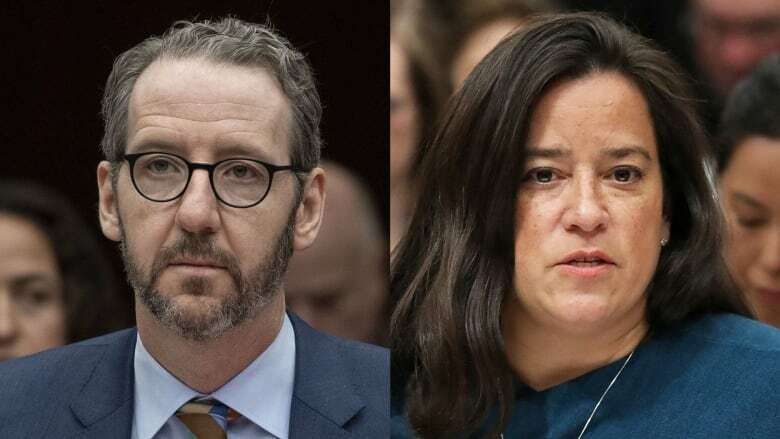 Gerald Butts, Prime Minister Justin Trudeau's former principal secretary, challenged former attorney general Jody Wilson-Raybould's version of events on the SNC-Lavalin file during testimony before the House of Commons justice committee in Ottawa Wednesday. Butts said there was no co-ordinated effort inside the Prime Minister's Office (PMO) to pressure Wilson-Raybould to overrule the director of public prosecutions and negotiate a deferred prosecution agreement (DPA) with SNC-Lavalin so it could avoid a trial over allegations it used bribery to secure government contracts in Libya. "Absolutely not," he said when asked if he or anyone else exerted such influence on the former minister. "I really don't have an opinion on what decision the current or former attorney general should make. I'm glad I'm not in their shoes." Butts also categorically denied that Wilson-Raybould was removed from cabinet because of her refusal to pursue a DPA — as she herself said under questioning last week — and said rather the shuffle was prompted solely by former Treasury Board president Scott Brison's unexpected December resignation. Butts said he was not aware of her apparent discomfort about lobbying efforts on the SNC-Lavalin file until she was removed from the Justice portfolio in January 2019 as part of that shuffle. Under questioning from NDP MP Charlie Angus, Butts said he has a "very different version of events" than does the former attorney general and would not "cast aspersions" on a former colleague for what he called her subjective take on the matter. "What I am here to do is to give evidence that what happened last fall is in fact very different from the version of events you heard last week," he said. Reading from text messages he exchanged with Wilson-Raybould, Butts told the committee that the only meeting he had with her on the issue was held at her request. Wilson-Raybould had testified that they both had sought out the Dec. 5 meeting at Ottawa's Chateau Laurier. "Hey there GB — do you want to chat? I have a number of things to bring up … maybe you do as well? Tomorrow after Cabinet perhaps? Thx Jod," the text message from Wilson-Raybould said. Butts suggested that if Wilson-Raybould requested the sit-down — which was to include discussion of files other than SNC-Lavalin — it would be unfair to say he personally had pressured her to take a particular course of action on the prosecution. Butts said the government encouraged Wilson-Raybould to hire outside legal counsel — like former Supreme Court chief justice Beverley McLachlin — to solicit advice on whether she should sign a DPA. "This was a novel law. It was the first time it had ever been used," Butts said. Butts said the Prime Minister's Office wanted Wilson-Raybould to consider all options, given the potential for grave economic consequences for the company if it were convicted of the criminal offences. "In a case like this when so many people's livelihoods are stake ... we took a really hard look at it because you want to be able, when you go knock on your doors on the weekend, you wanted to be able to look employees and pensioners in the eye and say, 'We gave this a good hard look.' That's all that was motivating us," he said. Butts said the former attorney-general never made it clear to him that she had come to a final conclusion on the matter, adding he first learned she was not open to further intervention on this file from her appearance before the committee last week. If Wilson-Raybould felt the lobbying efforts to get her to consider hiring legal counsel for a second opinion on a DPA crossed the line, he said, "she had an obligation to at least inform the prime minister in writing." Butts said he doesn't understand why Wilson-Raybould continued to accept meetings on the matter months after she is said to have made a final decision not to pursue a DPA. "Why would there be a next step at all? Why would the Attorney-General take and solicit meetings on a closed matter?" Butts said. Conservative MP Lisa Raitt asked Butts if he knew the prime minister allegedly told Wilson-Raybould — during their Sept. 17 meeting on the issue — that "I am an MP in Quebec — the member for Papineau." Raitt said that political considerations should not drive legal considerations. Butts said he "absolutely" agreed with that principle but added he was not at the meeting in question. "There's a gray area in what you think is a political consideration," Butts said. Asked whether it was appropriate to mention an upcoming provincial election in Quebec in discussions about signing a DPA — something Wilson-Raybould said happened at a meeting with Trudeau and Clerk of the Privy Council Michael Wernick — Butts said public policy decisions are not made on the basis of electoral fortunes alone, and noted that the government concluded its NAFTA negotiations by agreeing to controversial dairy provisions that don't sit well with farmers in Quebec. Under questioning from Raitt, Butts said the PMO was principally concerned about the fact that Wilson-Raybould only considered whether to pursue a deferred prosecution agreement (DPA) for 12 days. According to Wilson-Raybould's version of events last week, the director of public prosecutions decided on Sept. 4 not to pursue a DPA with SNC-Lavalin and Wilson-Raybould came to a similar conclusion on Sept. 16. Butts said Wilson-Raybould never told him she had made a final decision on this file by that date, which explains why lobbying efforts continued. "My understanding is that nobody in the PMO or PCO [Privy Council Office] knew that at the time either. In fact, it is not to my knowledge how the law works. My understanding, which was informed by the public service and lawyers in the PMO, is that the attorney general's power to direct the DPP extends until the time a verdict is rendered," Butts said. "My further understanding is that the attorney general is free to take advice on the decision until that point, and is obligated to bring fresh eyes to new evidence," he said. Butts said the government suggested outside legal advice because the legislation allowing for a DPA was so new; it had only just been passed as part of omnibus budget legislation less than six months earlier, in spring 2018. Butts said he believes Wilson-Raybould was "obliged" to consider new evidence in the case. The director of public prosecution herself reconsidered a DPA — when new evidence was presented by the company — on Oct. 9, he said. Butts said the January cabinet shuffle had nothing to do with the SNC-Lavalin affair at all but rather was prompted by the unexpected, and swift, departure of former Nova Scotia minister Scott Brison. "We had no idea he was even thinking about retirement," he said. "Let me say at the outset, categorically, the January cabinet shuffle had absolutely nothing to do with the SNC-Lavalin. In fact, I spent at least as much time working with colleagues to prevent the shuffle from happening as I did in preparing my advice for it," Butts said. Butts said the prime minister already had made his pre-election shuffle and was happy with the existing lineup. At first, Trudeau wanted to move Wilson-Raybould to the Indigenous Services portfolio, but she did something Butts said he has never seen before in government: she refused the position outright, saying she'd spent her whole career fighting the Indian Act. Butts said Former Treasury Board president Jane Philpott flagged to the prime minister during an in-person meeting on Jan. 6, 2019 — before the actual shuffle — that Wilson-Raybould might perceive a move to Indigenous Services as a demotion from a portfolio she loved: justice. Butts said Philpott then told the prime minister that she worried Wilson-Raybould might wonder if her move was connected to the "DPA issue." Trudeau assured her that move was not at all related to the DPA or SNC-Lavalin, but rather to Brison's departure and the need for an experienced minister to take over his Treasury Board portfolio. Butts said that was the "first time I ever heard anyone suggest that this cabinet shuffle was in any way related to the SNC-Lavalin file." Butts said he believes he and Wilson-Raybould had worked well together. "I felt like we could generally work things out," Butts said. He says trust between the two broke down in the context of the cabinet shuffle when Wilson-Raybould voiced displeasure with any sort of move. Butts said he didn't come before the committee to "quarrel with the former attorney general or say a single negative word about her personally" but added that, at all times, the Prime Minister's Office believed the decision to direct the director of public prosecutions to sign a deferred prosecution agreement (DPA) with SNC-Lavalin would be Wilson-Raybould's alone to make. Butts said that because so many jobs are at stake — more than 9,000 direct jobs, but also many in the company's supply chain — people in government suggested Wilson-Raybould should solicit outside legal counsel on whether it was appropriate for her to pursue a DPA. Butts said Wilson-Raybould should have raised any and all concerns about what she has described as inappropriate pressure with the prime minister directly. "This is a basic and important point," Butts said. "If any cabinet minister is made aware of something they think is wrong, I believe at a minimum they have an obligation to inform the prime minister soon after they become aware of it," he said. "If it is a question of law and that minister is the attorney general, the obligation to inform the prime minister is of an even higher order. And it ought to be in writing so that its significance isn't lost on its lay audience."